On the way home from NYC Cathie stopped at Fairway on 125th Street, a fabulous store, & brought home a pound of unpasteurized Jumbo Lump Crabmeat. The plan was to fulfill our visiting daughter Lissa’s request for Thai Crab Cakes. But after a scorching hot day, the evening called for a cool refreshing salad. The substitution worked out well. 2. 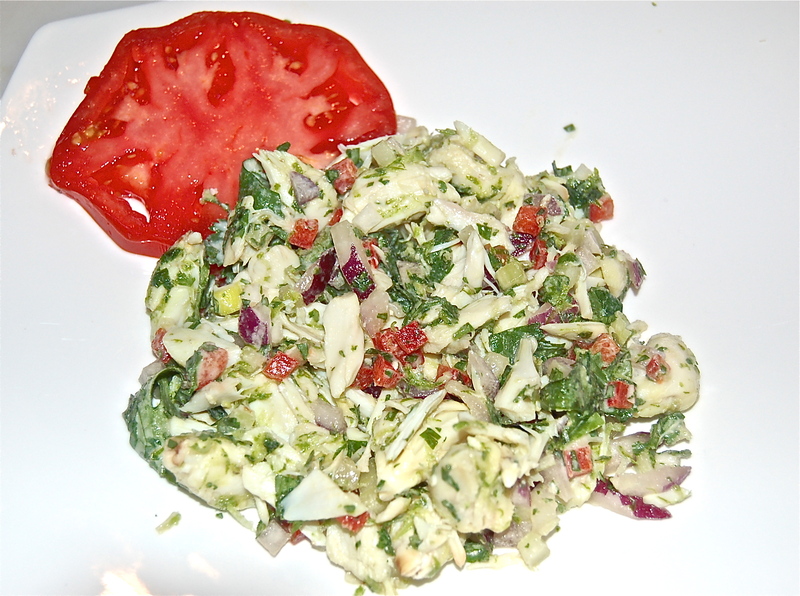 In a large bowl, combine the Crabmeat & Lime Zest and toss with just enough Dressing to lightly coat the Crabmeat. Taste for seasoning. 3. In another bowl, combine the Pepper, Celery, Red Onion, Cilantro & S&P and toss with just enough Dressing to lightly coat the vegetables. Taste for seasoning. 4. Combine the contents of the two bowls, mixing very gently to blend. 5. Mound the Salad in the center of the plate. Arrange the Tomato slices the Avocado slices around the salad. 6. Add more of the Dressing if necessary. To accompany the Crab Salad, the dinner called for a side dish of a green vegetable, but not another salad green. Garlicy Broccoli Rabe filled the bill, & the sauteed Baby Potatoes added the crunch. 1.in a large pot bring a small amount of water to a boil. 2. Wash the Broccoli Rabe & cut 1″ off the stems. 3. Add the Broccoli Rabe & steam for 6 minutes, covered. 4. Remove & put into a bowl of cold water which both stops the cooking & maintains the vegetable’s color. 5. Drain & cut into 1″ pieces. 6. Heat a deep sided saute pan & add 2 TB of Olive Oil. Add the Garlic & saute until fragrant & lightly colored. 7. Add the Broccoli Rabe, a splash of water & cook until heated & tender. Remove to a bowl. Reserve & set aside. 1. After washing & scrubbing the Potatoes thoroughly, dry & cut in half. 2. Heat the same saute pan & add 2 TB of Olive Oil. When shimmering, add the Potatoes & saute until they are fork tender & brown. 3. Add the reserved Broccoli Rabe & toss it all together. 4. If required, finish with another splash of Olive Oil & your’e ready to plate.